At PostScan Mail, we offer mail and package shipping along with our virtual mail services and it has never been more convenient and cost-effective. Through our easy-to-use online application, you can ship one or multiple items with our mail consolidation service and at a competitive cost for shipping. Your mail items are handled with the care and confidentiality you expect, all done with professionalism by our mail ninja agents. We handle shipments for a fee as little as $0.85 per item. With United States Postal Service (USPS) as our courier, their prices apply to our services, along with the minimal handling fees that we charge. Because your convenience matters, PostScan Mail offers three shipping options: “First-Class”, “Priority” and “No Rush”. It all depends on your needs, for example, there is no need to pay for “priority” shipments if it is not urgent. At PostScan Mail, we try to make our services as suitable to your needs as possible. Prices of shipping materials apply. Shipping fees for 1 lb as low as $5.75 and $166.75 for 70 lb. Shipping fees for 1 oz as low as $0.98 and $3.50 for the 13 oz. Shipping fees for 1 lb as low as $5.60 and $132.29 for oversized items. 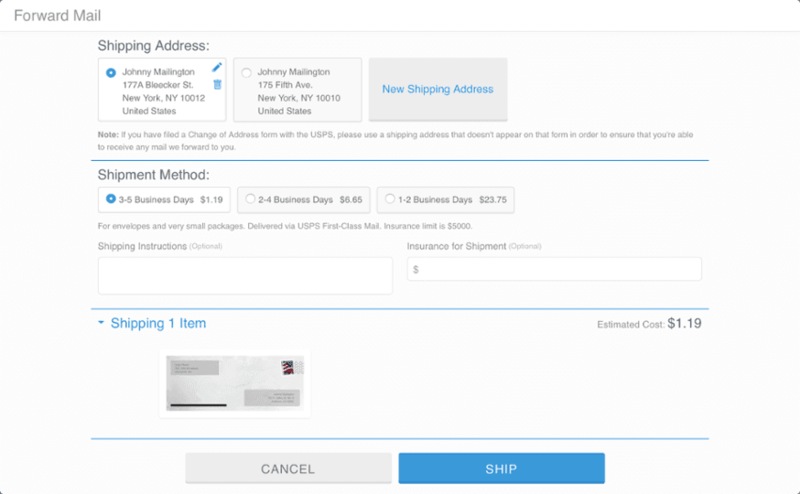 USPS economical prices are offered with the advanced virtual mail services of PostScan Mail which makes the experience of shipping your items as cost-effective and convenient as possible. And above all of this, you will handle your shipments remotely through your PostScan Mail account. Join PostScan Mail now and enjoy our competitive shipping fees.